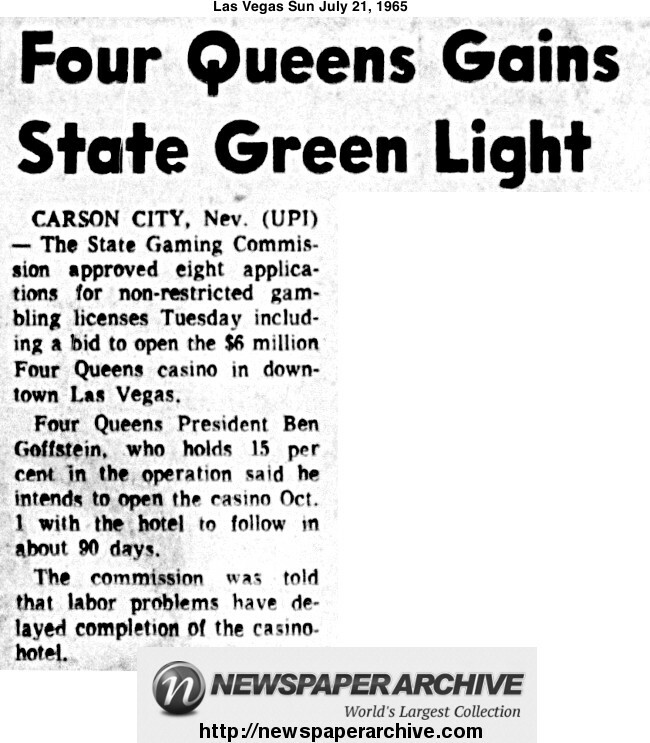 In July of 1965 the Nevada State Gaming commission approves a non-restricted gaming license for the Four Queens. Goffstein's prediction for an October 1965 opening date would prove to be a little optimistic. 1966 would be an eventful year in the history of the Four Queens. Use the navigation buttons below to learn more and explore the history and collectibles of the Four Queens. 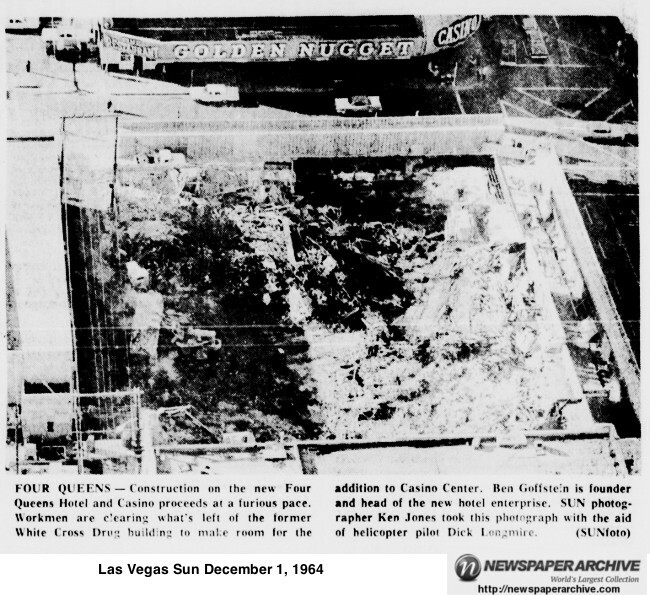 The planned opening date of July 1965 was delayed for almost a year due to construction delays. 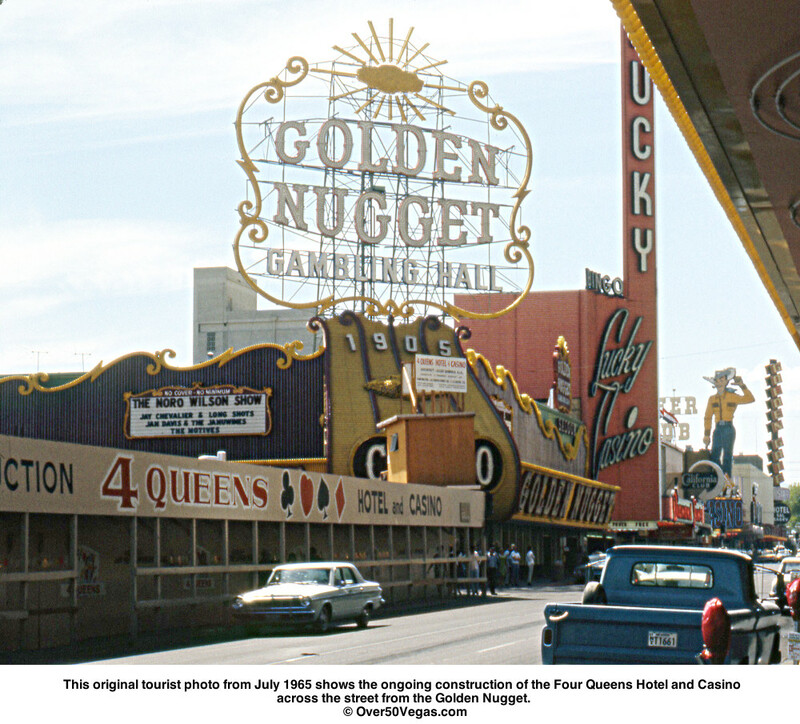 Four Queens Hotel and Casino in downtown Las Vegas. 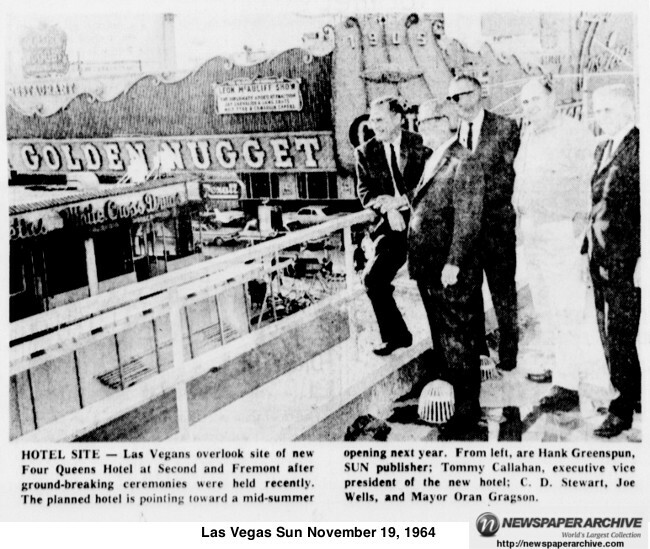 It would officially open a year later on June 2, 1966. Most stories of the Four Queens start by saying that Ben Goffstein built and owned it. This is not actually accurate since there were over 30 initial investors in the Four Queens. When it was built he was a 15% shareholder in the corporation that owned the Four Queens. However, the credit for the concept, the vision, and the successful management of the Four Queens would seem to rest solely with him. Goffstein named the property for his four daughters. Some locals bemoaned the loss of the businesses on the corner. But others saw it as progress. 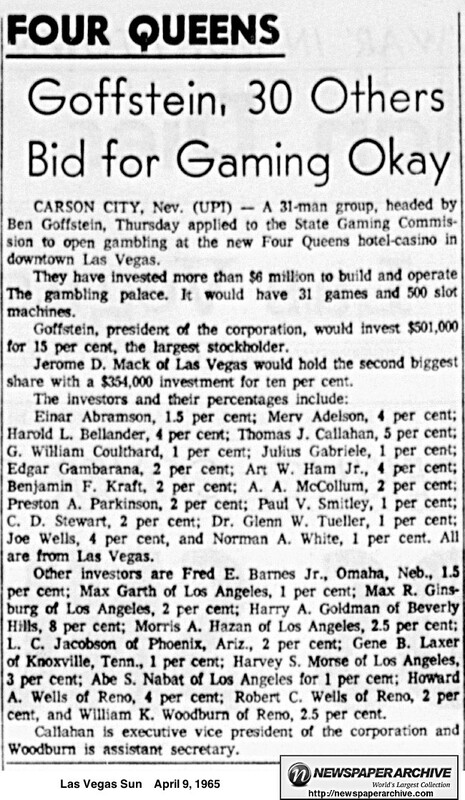 The original 31 investors in the Four Queens are listed with Ben Goffstein as the president and largest investor. A day after the gaming commission approved the 31 initial stockholders, two of them applied to be removed. The Gaming Control Board would consider their application for removal but not act on it until the following year. Ben Goffstein had earlier worked for publishing magnate William Randolph Hearst's newspapers and was commonly known to have connections to organized crime and allegedly used those connections in circulation wars for the Hearst corporation. 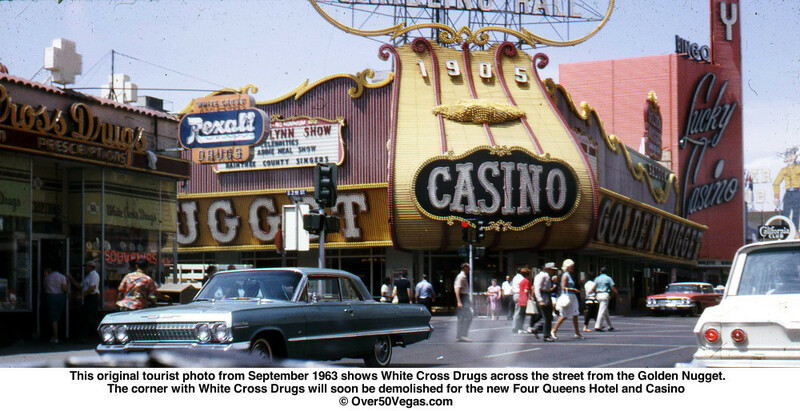 After Bugsy Siegel's sudden death he was part of the management of the Flamingo and later the Riviera. Ben Goffstein married former showgirl Alice Virginia "Dottie" Wood who also had a hand in decorating the $5 million Four Queens. 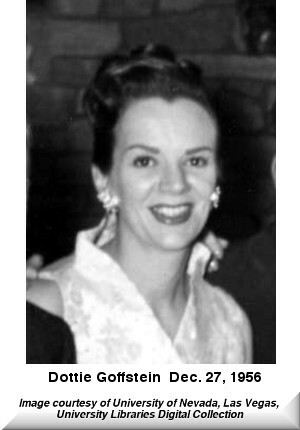 She was working as a member of the Lindsay Sapphire Dancers at the Flamingo, when she met casino Vice President Benny Goffstein, who she would later marry on New Year's Eve 1954. 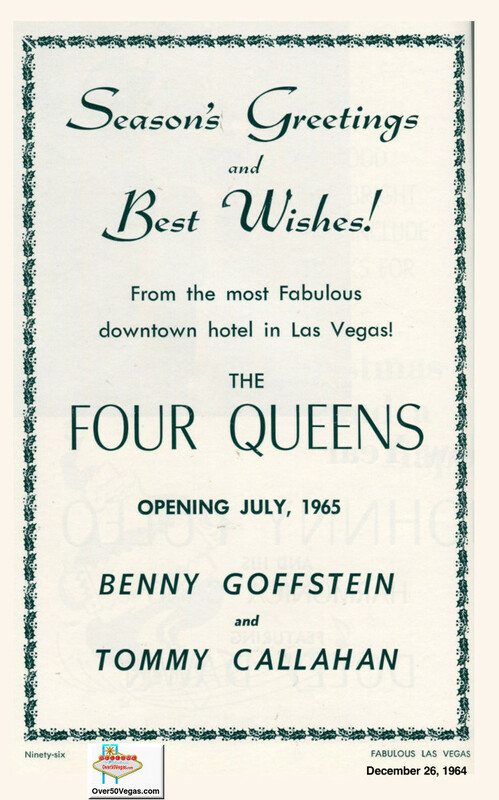 This ad in the Fabulous Las Vegas Magazine 1964 Christmas issue shows an anticipated opening date of July 1965. That prediction turned out to be a little optimistic. The photo below shows what the Four Queens actually looked like in July 1965! 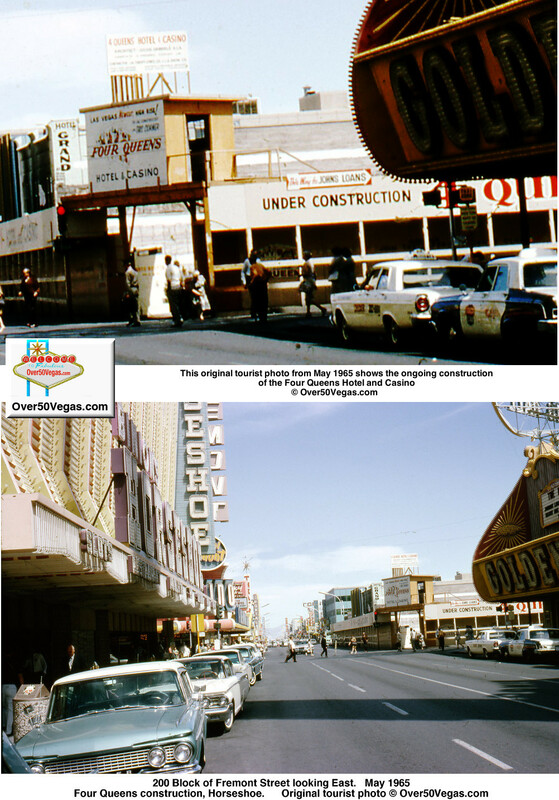 RISING SKYLINE —The urban touch of Americana is rapidly taking shape in Vegas’ downtown casino center and vicinity. 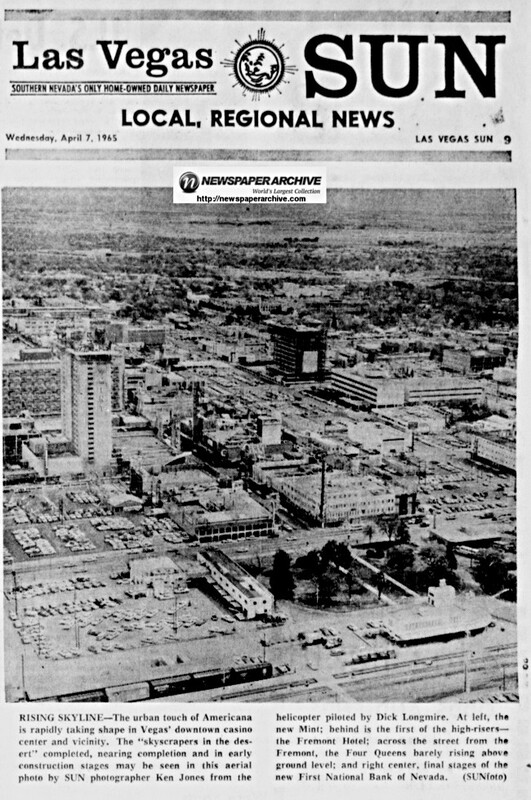 The “ skyscrapers in the desert” completed, nearing completion and in early construction stages... the new Mint: behind is the first of the high-risers— the Fremont Hotel; across the street from the Fremont, the Four Queens barely rising above ground level; and right center, final stages of the new First National Bank of Nevada.